Montana quarterback Gerald Kemp bursts through the line on a quarterback keeper Sunday afternoon at Washington-Grizzly Stadium. Kemp ran for two touchdowns and threw for two more in the Grizzlies’ first scrimmage of fall camp. Running back Jordan Canada leaps for yardage near the goal line. 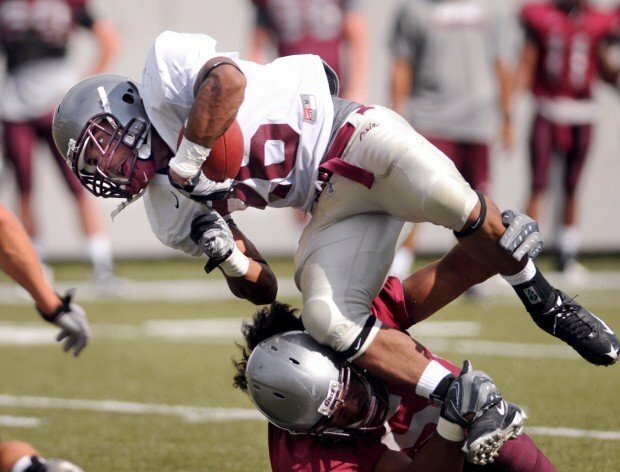 The continuing progress of Gerald Kemp was a key storyline Sunday in Montana's first football scrimmage. Quarterbacking the No. 1 unit exclusively in the absence of Jordy Johnson, who is nursing a sore ankle, Kemp gave 650 fans at Washington-Grizzly Stadium a glimpse at his expanding repertoire. He threw for two touchdowns and ran for two, impressing his head coach in the process. "Gerald plays so well when there's space, and he did some great things mentally to help himself create space," Montana coach Robin Pflugrad said. "Once he had that, boy he can go. He can go right, left, straight ahead. He can go backwards and restart. Seriously that's very difficult to do. "He made some good decisions. I was really happy with his performance today." Even if he doesn't win the starting job for the Sept. 3 season opener at Tennessee, Kemp figures to see key playing time with his unique talent as an option QB. His well-timed pitch to running back Peter Nguyen sprang the running back for a 55-yard gain on the first series of the scrimmage. Several plays later, he feathered a screen pass to upstart Jordan Canada for a 29-yard score. Kemp followed up with option touchdown runs of 30 and 20 yards. Then came the play that served as a dead giveaway as to how he spent his summer in San Diego. While on the move, he fired a pinpoint 21-yard touchdown pass to Antwon Moutra. Kemp finished with 112 yards rushing on nine totes and completed 5 of 7 passes for 63 yards. Afterwards, he talked about how helpful it's been to work with four SoCal mentors the past two months. The list includes ex-NFL quarterback Akili Smith. "I probably worked harder this summer than ever before," the junior said. "Passing was definitely something I focused on. "I know in order to run an offense you have to be able to run, pass, make good decisions, the whole package. It's a learning process. I dedicate most of that to my O-line today, giving me time to get my looks and checks in and my reads down, being able to deliver the ball on time. And my receivers made some good catches." The Griz offense piled up seven touchdowns and generally outshone a more established Montana defense. But in fairness to the ‘D,' it faced a no-huddle look a good portion of the afternoon and some regulars worked overtime in sweltering heat. "The open-field tackling was disappointing, specifically early in the game," Pflugrad said. "Now again, a lot of that was Gerald. Peter Nguyen had a nice run. Jordan Canada had some open-space runs. "We did have some decent things in the air as well. It was nice to see (wideout) CJ Atkins come in and make some plays." Eleven different receivers caught passes, with freshman Sean Haynes' 74-yard bomb from Shay Smithwick-Hann standing out because of the way Haynes busted a tackle. Nguyen had only one carry in the game, while Canada finished with 25 yards on three rushes and Dan Moore five carries for 20 yards. "Dan Moore gives us a different punch we didn't have all spring," Pflugrad said. "(Nguyen) and Jordan Canada are somewhat similar and then Dan can come in and hopefully do some damage in the power game." Defensively, senior tackle Bryan Waldhauser had a solid day Sunday with a tackle for a safety and a sack. Senior end Bobby Alt, redshirt freshman end Zack Wagenmann and freshman linebacker Addison Owen each had a sack apiece. Middle linebacker Caleb McSurdy had the hit of the day on a run up the middle late in the scrimmage. Now comes the real rough part for the players - two-a-day practices under the hot August sun. Pflugrad said he wished it was "10 degrees hotter." "There's a record-breaking heat wave down in Tennessee," he noted. "I keep looking at that schedule and every time I look at it, it still says Tennessee on it. So we're going back there I guess. "It's hard to get all excited about your first game when there's so many things you're still working on. It's going to be an in-progress week. Without Jordy Johnson here - he took a lion's share of the reps - now we have to look around and see what quarterback does what better than the other ones. Then at some point in time you have to get a game plan ready to go." Notes: Jordy Johnson attended the scrimmage, walking around with a slight limp ... Cornerback Trumaine Johnson practiced but did not play in the scrimmage after battling strep throat this past week ... Standout kicker Brody McKnight sat out the scrimmage so Pflugrad could look at his other kickers ... Nate Montana quarterbacked the No. 2 unit and completed 5 of 10 passes for 31 yards and a TD. Senior Kavario Middleton had the catch of the day on Montana's 5-yard TD strike, reaching over a defender ... Smithwick-Hann was 4 for 5 passing for 81 yards ... True freshman Nate Harris is making his mark at cornerback, according to Pflugrad ... After Sunday's scrimmage, the Griz had a little water balloon fun under the supervision of the Griz coaching staff. Bill Speltz can be reached at 523-5255 or bill.speltz@lee.net. 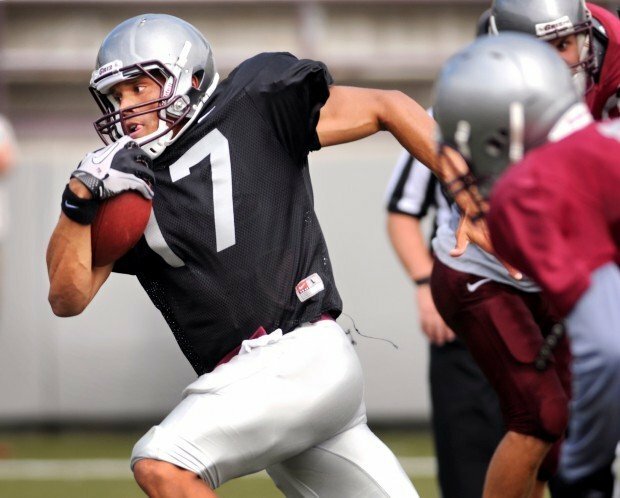 Former Montana Grizzly running back Chase Reynolds was waived by the Seattle Seahawks on Sunday.